Nonstick cookware has recently been in the spotlight when, in 2005, the US Environmental Protection Agency sued DuPont for withholding information that showed that chemicals in their nonstick coating, Teflon, caused cancer and birth defects. The EPA then released a statement that these chemicals (known as PFOA or perfluorooctanoic acid) are ‘likely to cause cancer.’ Unfortunately, many consumers are still confused about the real health risks caused by these items. High quality stainless steel, on the other hand, is a safe and non-reactive material to cook on. Not all stainless steel items are created equal, though, and it pays to invest in the highest quality possible. There are several points you will want to keep in mind when searching for new stainless steel cookware. First, a good saucepan, frying pan, or stock pot will have several layers of metal at the bottom- a layer of copper or aluminum sandwiched between stainless steel. This allows for a more even heat distribution, and lessens the risk of burning your food. This construction does not allow any aluminum to leach into food. Second, it is important to take into consideration the ratio of metals that have gone into the item you are considering. Look for a ratio of 18/10 and no less than 18/8. The 18 refers to the amount of chromium and the 10 or 8 refer to the amount of nickel. These ratios result in a strong piece of cookware that is highly stable and will not leach heavy metals into your food. 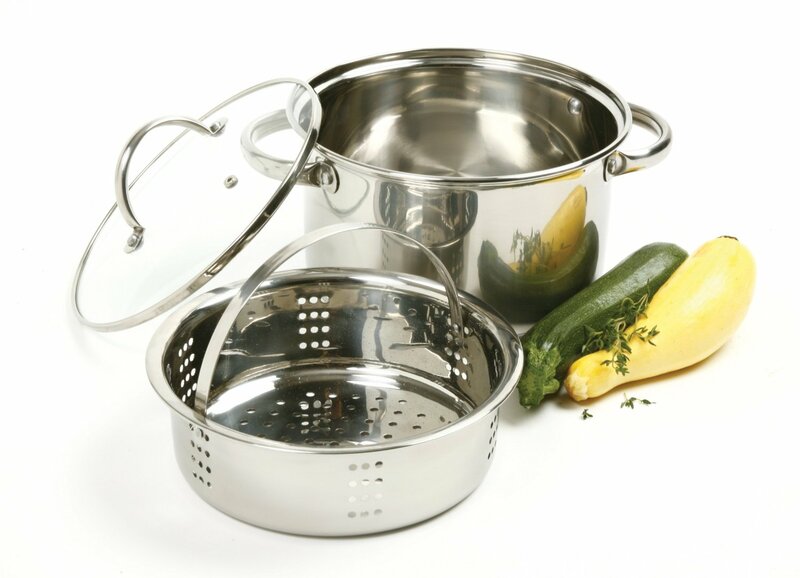 You will be happy to know that caring for your stainless steel cookware is very simple. A soft sponge and some mild detergent should do the trick for most cleaning needs. It is important to avoid coarse scouring sponges as they can scratch and damage your stainless steel items. We also do not recommend washing your cookware in an automatic dishwasher. Heavier duty messes will clean up well with a soak in warm soapy water and a bit of baking soda added to the detergent for some mild scrubbing. With proper care, high quality stainless steel cookware and bakeware should last you a lifetime, and you will rest easy knowing you are doing what is best for the health of those you are cooking for.